I haven't actually used this card yet, so I could be wrong, but I feel that it is too powerful; especially considering the zero influence and play cost. I envision a deck that includes three of these and three "Freedom Through Equality"s to potentially turn any two-pointer into a four-pointer. Combo with a few expose cards like Infiltration and Drive By to confirm the presence of an agenda in a remote server. And/or combo with Globalsec Security Clearance or Find the Truth to get the agenda off the top of R&D; no multi-access required. If you go the latter route, you may want to have a Councilman on the table to stop an un-rezzed Jackson from ruining your Mad Dash. 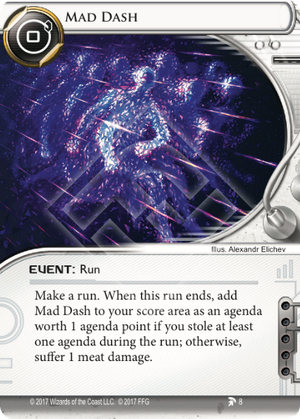 Now I would hesitate to use this card versus Jinteki, especially PE, unless you've already stolen their Philotic Entanglement or you'll get game point. Perhaps this won't work as well as I envision, but I'm definitely going to try it out once it is coded on jinteki.net.